This appears an especially poor month but it’s been a phenomenal year with some major stuff still to come (Candyman, Deadbeat at Dawn, City of the Living Dead, de Niro & de Palma) - so I can’t complain. You can vote for your favourite Arrow releases of the year (and a whole lot more) in the Criterion Forum BAFTAS: here. Anyone know if it’s possible for Arrow to pick up Death to Smoochy? I think it's with FIlm4 here, so more likely to come from either Indicator or BFI at this point. Both labels have released Film4 titles. Then again there might be complications with acquiring the master from Warner Bros. You never know though - Film4 are releasing a restoration of Bill Forsyth's Local Hero in the new year, which is in a similar rights situation to Death to Smoochy (as far as I'm aware). Unlikely at this point, but BFI could've potentially done it for their upcoming comedy season (it looks likely their release for that season will instead be 9 to 5, and possibly some sort of Laurel & Hardy release...). Any hints whether Arrow will release the films that are in Criterion's Eclipse line of the The Warped World of Koreyoshi Kurahara and Nikkatsu Noir boxsets? This was kind of my thinking, too. But, to be fair, Indicator has been “braver” in some cases than I would have thought, so who knows. Either way, I’d love to see this get a nice Blu release. No, I love that film. Was high on my list of Film4 'hopefuls' along with Ghost Dog, The Straight Story, and a few others (Local Hero is coming and When the Wind Blows got a BFI disc in January). The lone Academy release for January: Born Yesterday (UK only). So, there's definitely a Sony deal with Arrow. Maybe they'll be the ones to delve into the film noir that Indicator have, thus far, neglected aside from Lady from Shanghai and The Big Heat. Indicator seems to have started off by releasing a lot of the "big classics" they could get their hands on (Last Detail, Christine, Body Double, and so on) before delving into more esoteric fair, leaving Arrow to work on the things they passed on or did not seek out. Eureka doesn't seem as if they're going to do anything else. If Eureka aren't doing any more, how did they license Night of the Creeps? I hope they have at least a few more lined up, perhaps some for MoC. Arrow have announced three so far: Gas Food Lodging, Bob & Carol & Ted & Alice, and Born Yesterday. Does feel like they're 'mopping up' a bit after Indicator and MoC (and even Signal One) but these are still some pretty good titles. Perhaps we'll even get one or two for Arrow Video yet. Mothra, The Blob or The Big Gundown would be fun! Oh, I didn't realize Night of the Creeps was Sony. Well, I guess Eureka's just slowly working their way through whatever they've licensed, or have licensed new titles since. If Arrow Academy is the one who ultimately winds up doing boxed sets of Sony's film noir classics, not to mention some of the TT stuff like Bonjour Tristesse, well, they can mop up all the sloppy seconds they want. Maybe Arrow Video could be the one to put out Snake in the Eagle's Shadow? And subsequently mentioned that it shows Southland Tales on the reverse, too. What this implies is a possible Warner Bros deal, either limited (one title, one territory) or extended (multiple pictures?). Most likely it was aided by Friedkin himself and/or perhaps somebody in the know (BFI have somehow been able to license from Warner Bros in the past, albeit with extreme caveats in the cases of both The Devils and the two early Scorsese titles). Also of interest is whether Southland Tales is for the US (Sony), the UK (Universal) or both. The postcard was in a US copy of Orgies of Edo, but that doesn't necessarily mean it's US exclusive, nor does it imply UK exclusive - I mentioned elsewhere that Dillinger has been on postcards in the UK, but has yet to be released here (it's one of a few US exclusives from Arrow to date). Arrow do have active deals with both studios, so perhaps it was good timing and they negotiated a dual territory release, as a follow-up to their extremely popular Donnie Darko release. 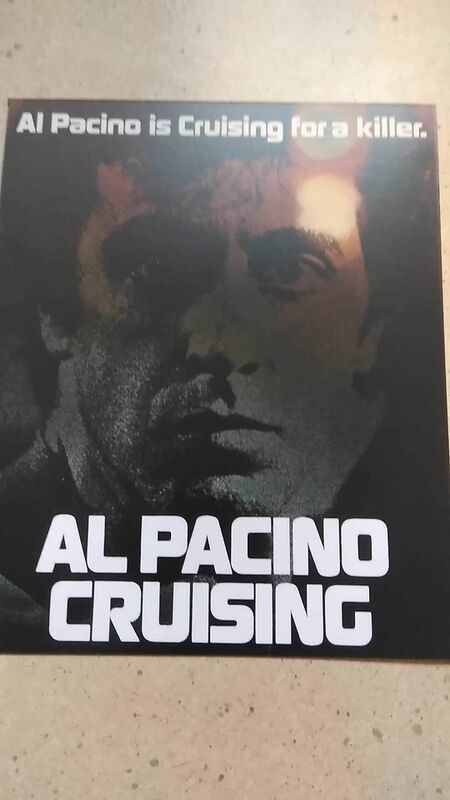 Anyway, whilst I might not pre-order Southland Tales, I've somehow never seen Cruising - despite being a huge fan of both Pacino and Friedkin - and will get hold of it right away. Forbidden Photos of a Lady Above Suspicion is also listed as coming in the postcard insert with Orgies of Edo. When I’m allowed to tell you the title of my next Arrow commentary assignment, you are probably going to jump for joy. It’s one of those impossibly rare horror titles we thought we’d never see on disc... but we will (and I already have)! No idea if any of those titles fit the Lucas tease. Is he referring to the the idea that he never thought he'd see it on an Arrow disc or just a disc in general? Because if it's the latter there aren't many horror films I can think of off the top of my head that are particularly rare in any instance. I don't think I'm not processing his post correctly. The latter, and there are plenty, just like every other area of cinema. Being that it’s Tim Lucas saying this, I’d imagine it’s from somewhere during the 1950’s - early ‘80’s, but that’s not saying much. So in America, Severin got All the Colors of the Dark. Was hoping Arrow would be able to “rescue” this title. I've never heard of Dave Made a Maze before... it sounds pretty interesting. Dave Made a Maze is directed by Bill Waterson. But not THAT Bill Waterson. Some other guy. I wasn't really a fan aside from it's nifty Henson by Gondry like maze. A possible hint from Tim Lucas is that he asked on FB "What is the correct pronunciation of "Lone Fleming"?" I asked if this was a hint of the upcoming Arrow project and he replied "A very, very, very oblique one!" To me the pronunciation question naturally implies the actress' name will be mentioned in an audio recording so take that hint in whatever way you wish.